Burton & Uttoxeter Live At Home provide befriending, social groups & activities, days out and signposting for people over the age of 55 years. They are holding a Live at Home FREE Opening Event on Monday 17th September at Confessions at the Trinity, George Street, Burton on Trent, DE14 1DP from 10am to 12 noon. Weekly activities will start from 17th September 2018, and are all listed on the attached poster. Events will include Noughts & Coffee, fitness classes, craft groups, social groups and bereavement support. 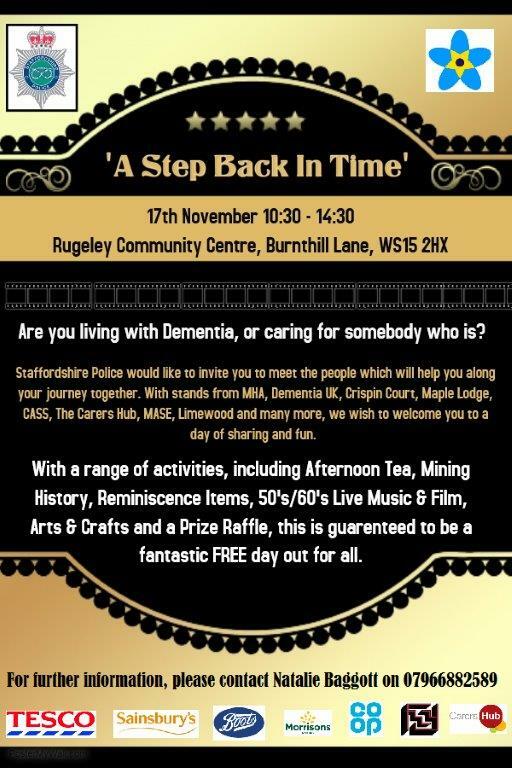 Staffordshire Police and local partners have organised a day of sharing and fun at Rugeley Community Centre on 17th November between 10:30am and 2:30pm. Please see poster for full details and contact details for more information.